A documentary shot by filmmakers all over the world that serves as a time capsule to show future generations what it was like to be alive on the 24th of July, 2010. BEFORE: Now more than halfway through the documentary chain, these next two films are miscellaneous. They didn’t really fit in with any of the other subchains so I decided to stick them together right before the big wrap-up with U.S.A. documentaries. 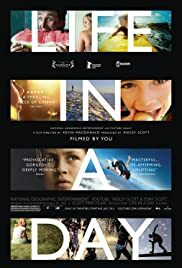 Life in a Day is interesting as the footage comes from everyday people all around the world as opposed to a central filmmaker shooting everything. AFTER: To be honest, Life in a Day was much better than I was expecting it to be. I didn’t think it was possible to make a coherent documentary from over 4500 hours of footage from people all around the world who were not collaborating in any way. It’s amazing to think that even though we are all unique, we’re also all the same. A lot of the credit must go to the editor, Joe Walker, and it does. He gets top billing in the end credits, above the director Kevin Macdonald. This could have been a mess: an incoherent, unemotional, montage of clips just thrown together. But Kevin Macdonald, along with a large team of assistant editors, was able to whittle down 4500 hours of footage into one 95 minute documentary. That’s over a 2800:1 shooting ratio (footage shot compared to footage used), much larger than the notoriously large shooting ratio of Apocalypse Now at 95:1 and larger still compared to an average film ratio of 10:1. Life in a Day is organized using a combination of montage sequences (e.g. people waking up, eating, etc.) and longer clips that detail a moment or two in one person’s life. The opening scenes where a father and son saying good morning to the boy’s mother who had passed away got me invested in the documentary right away. It sets up right away that this film isn’t only going to be about the good, it’s going to be about the bad as well, just like life. Life in a Day is all about contrast: good and bad, rich and poor, love and hate, life and death. But it’s also about similarities; how we are all connected in the things we do everyday. From sleeping, eating, working, and talking, we can relate to each other and know that no matter how bad things may be, someone else has probably experienced the exact same thing.